Nelson Mandela is released from prison. 27 townships declared unrest areas in terms of the Public Safety Act No 3 of 1953. Commission of Inquiry into the Death of Clayton Sizwe Sithole Mandate: To investigate the circumstances surrounding the death in detention of Clayton Sizwe Sithole on 30 January 1990. Commission of Inquiry into Certain Alleged Murders Mandate: To inquire into and to report on certain alleged murders and other unlawful acts of violence committed in the Republic of South Africa (including self-governing territories). If such murders and acts of violence are found to have occurred, to investigate what bodies and organisations were responsible for these acts. The mandate was extended to include an investigation into and report on the allegation that one Anton Lubowski was a paid agent of the SADF: Military Intelligence Section. Ref: RP 108-90 (A); RP 109-90 (E); S297/151 (A); S297/152 (E). Mandate: To investigate and report on the effectiveness of existing measures and their application with regard to the salvage of the stranded fish trawler 'An Hung No. 1' and its cargo, and to make recommendations accordingly. South African Democratic Teachers Union (SADTU) is formed. The government puts forward the 'Clase Models', which set out the conditions under which white state schools can admit black students. Patricia De Lille appointed foreign secretary and relief and aid secretary of PAC. Lindiwe Sisulu returns to South Africa and begins works as personal assistant to Dr Jacob Zuma. Baleka Kgositsile returns to South Africa,after which she is elected Secretary General at first national conference of ANC Women's League. Geraldine Fraser-Moleketi returns from exile at request of CPSA. She resumes work as personal assistant to Joe Slovo and Chris Hani. Barbara Hogan released from prison. Gill Marcus returns from exile, and takes up post in ANC's Department of Information and Publicity. January, Eight veteran ANC leaders, together with the leader of the Mass Democratic Movement (MDM) and the Congress of South African Trade Unions (COSATU) meet the external hiearchy of the ANC in Lusaka. 15 January, Accedes to the Montreal Protocol on Substances that Deplete the Ozone Layer. February, The regime is forced to remove the ban on the ANC and other organisations. 2 February, President F. W. de Klerk made a speech at the opening of Parliament, announcing among other measures, the lifting of a 30-year ban on the ANC, the PAC and other anti-apartheid organisations, the suspension of the death sentence until further review, the release of some political prisoners and the partial lifting of restrictions on the media and on some detainees. 5 February, The extreme right has reacted with anger to the reforms by Mr. de Klerk. One black was killed in the town of Klerksdorp and the United Kingdom Embassy in Pretoria was attacked. 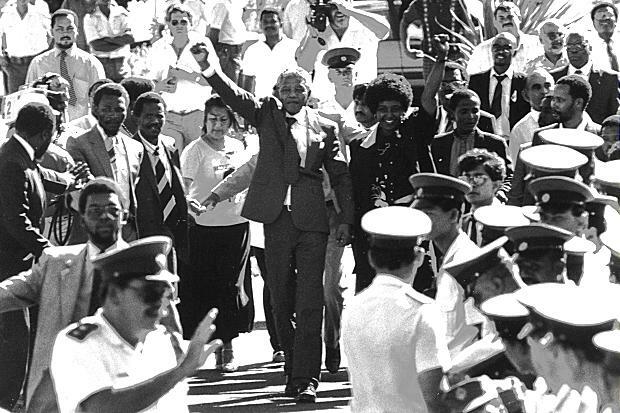 11 February, Nelson Mandela, leader of the ANC, freed after twenty-seven years in jail. 21 February, The Star newspaper reported that Defence Minister, Magnus A. Malan, knew as early as 1987 of a secret "hit squad" made up of police officers which was used to kill opponents of apartheid. The allegations pose a growing embarrassment to Mr. de Klerk, who faces demands for the dismissal of the Defence Minister. In a related development, the activities of the Civil Cooperation Bureau, the military unit involved in the assassinations, were suspended pending the outcome of a judicial inquiry. The Minister also revealed that Anton Lubowski, the SWAPO white official killed by assassins in Windhoek last September, was an agent of the South African Defence Force. 24 February, More than 100,000 persons attended a rally in Durban addressed by Nelson Mandela, who urged his followers to end the factional warfare that has taken more than 2,500 lives in the last five years in the Natal region. 27 February, Nelson Mandela meets ANC officials in Lusaka. March, Violence erupts in South Africa's 'homelands'. Ciskei falls in a military coup. 2 March, The African National Congress (ANC) elected Nelson Mandela as Deputy President of the organisation. it also announced its decision to move its headquarters from Lusaka to Johannesburg as soon as possible. 4 March, Several hundred political prisoners began a hunger strike at Robben Island, the country's highest-security prison, to demand that President de Klerk release them under a general amnesty. Military officers headed by Brig. Oupa Gqozo overthrew the leader of the "independent homeland" of Ciskei, Lennox L. Sebe, while he was in Hong Kong. Brig. Gqozo and three other officers have formed and executive committee to run the administration with civilian help, "until a society based on democratic principles can be established". South African authorities sent troops, at the request of Brig. Gqozo, to restore order. 5 March, According to US Business in South Africa 1990, published by the Investor Responsibility Research Centre (IRRC), despite the fact that 201 USA companies have disinvested from South Africa since 1 January 1984, 123 remain there together with 177 from the UK and 142 from the FRG. Gave the President power to make emergency regulations and to govern the state of emergency which had been declared in some districts under Proclamation 3 of 1990. 14 March, In an exclusive interview with "The Herald", the ANC military commander Joe Modise, stated that the organisation could consider the suspension of the armed struggle but not the laying down of arms, to facilitate negotiations. 15 March, Major cabinet portfolio changes are made to co-ordinate economic policy and constitutional negotiations. 16 March, It was announced that talks between Government officials and an ANC delegation led by Nelson Mandela would open in Cape Town on 11 April. The talks are intended to discuss obstacles to the process of negotiations. 20 March, Independence of Namibia. 20 March, After 75 years under South African control, Namibia became independent and Mr. Sam Nujoma, leader of the South West Africa People's Organisation, was sworn in as the country's first President by the United Nations' Secretary-General, Mr. Javier Perez de Cuellar. 26 March, Police opened fire on anti-apartheid protesters in the township of Sebokeng, near Johannesburg, killing at least 14 people and wounding more than 380. The protest was organised against high rents and racially segregated local facilities. Mr. Piet Clase, Minister of Education for whites, announced that the regime had decided to abandon the principle of segregated state education. From January 1991, white state schools will be allowed to accept black children, provided that a majority of the parents of such schools give their consent. 28 March, Six black political prisoners who would have been freed at the end of the year have been released from Robben Island prison, increasing to 22 the number of prisoners released since the end of the 11-day hunger strike at that prison. 31 March, The ANC decides not to hold talks with the South African government scheduled for 11 April, due to the killing of defenceless demonstrators in Sebokeng. Meeting between Nelson Mandela and Chief Buthelezi of the Inkatha Freedom Party, is also called off. 31 March, The ANC announced that it was suspending plans to attend the scheduled talks with the Government in protest against the shooting by the police of demonstrators in the township of Sebokeng. 4 April, Signs bilateral monetary agreement with the government of Namibia. 5 April, The Venda homeland falls in a military coup. A military coup d'etat took place in the "independent homeland" of Venda. The coup, apparently bloodless, was the second in five weeks after the one in Ciskei. Coup leader Colonel Gabriel Ramushwana announced that he would manage the area's affairs until it is re-incorporated into South Africa. 6 April, Signs agreement with Togo regarding wildlife management in the Keran National Park. 9 April, South Africa:Signs memorandum of understanding amending the Customs Union Agreement of 1969. 14 April, Nelson Mandela admitted that members of the ANC had tortured dissident guerillas, but said the officials involved had been punished and any further torture had been banned. 18 April, In a parliamentary speech, President de Klerk rules out any possibility of black majority rule. 18 April, F.W. de Klerk announced the establishment of a Commission of Inquiry, led by Justice Richard Goldstone, into the police killing of 17 peaceful demonstrators at the township of Sebokeng. 20 April, Stating that the arms would be used in a white "counter-revolution", members of a far-right group stole from Air Force Headquarters in Pretoria a small arsenal, including machine-guns and R-1 and R-4 rifles. 27 April, Senior ANC leaders such as Joe Slovo, Thabo Mbeki and others, return to South African after a quarter of a century in exile. 'homelands' will be reintegrated into South Africa. May, ANC launched a national membership drive, with membership fee of 12 rand a year. 2 May - 4 May, The Groote Schuur talks take place between the South African government and the ANC. They reach agreement on conditions for full-scale negotiations on ending political conflict in South Africa. 2 May - 4 May, The South African Government and the ANC held their first preliminary talks with both sides expressing hopes for peace and for an end to apartheid. 4 May, At the end of their talks, the ANC and the South African Government issued a joint statement, entitled "the Groote Shuur Minute", according to which a working group was established to address the issue of the release of political prisoners. The Group was scheduled to complete its work before 21 May. In addition, temporary immunity from prosecution would be considered for selected members of the ANC and the Government would seek to modify its security legislation to adapt it to the new situation developing in South Africa, and it would work towards the lifting of the state of emergency. Both parties pledged once again to try and put an end to the "existing climate of violence and intimidation" and reiterated their "commitment to stability and to a peaceful process of negotiations". Efficient channels of communication would be established between the Government and the ANC. 6 May, P.W. Botha resigns from the National Party in protest against President F.W. de Klerk's reform proposals. 7 May, The Indemnity Bill of 1990, which allows exiles to be granted temporary immunity or permanent indemnity against arrest or prosecution, was passed by 105 votes to 33 at a joint-sitting of the South African Parliament. Only the Conservative Party opposed it. 8 May, President F.W. de Klerk tours nine European countries. 16 May, Government officials announced plans to abolish racial segregation in state hospitals. Some state-funded hospitals are reserved for whites only while others are divided into sections for blacks and whites. A small percentage are integrated. Most of the white population will feel little immediate effect from the measure as almost 90 per cent of them use private hospitals and clinics which are generally too expensive for blacks. 17 May, An Anti-Apartheid Movement Rally was held in London in protest against the visit to the United Kingdom of President de Klerk. Among the speakers at the rally were Lt. Gregory Rockman, the former officer of the South African Police, who was dismissed after speaking out against the brutality of the apartheid security forces. Lt. Rockman is now the National President of the Police and Prisons Civil Rights Unions, which organises black policemen and prison wardens. 18 May, South Africa:Signs agreement with Namibia concerning the appointment of representatives and privileges and immunities for representatives and their staff. 18 May, Five prison guards declared that they would continue their sit-in at the Embassy of the Federal Republic of Germany until more than 600 colleagues were reinstated. The five are among 650 prison guards who were suspended without pay in March after they joined the "illegal" Police and Prison Civil Rights Union. Justice Minister Kobie Coetsee announced that 400 of the guards could resume work, but that the prison service would continue to bar unionisation in the police force. Granted temporary or permanent indemnity against prosecutions for exiles returning to South Africa. Repealed by s 48 of the Promotion of National Unity and Reconciliation Act No 34 of 1995. 21 May, The Government's Custom and Excise office announced that South Africa's trade surplus widened to R969 million in April from R872 million a year earlier. The Government and the ANC received the report on procedures for releasing political prisoners which were drafted by the joint working group set up at Groote Schuur. There were indications that the report included a plan to grant amnesty for all political prisoners and exiles. The working group will now turn to other issues, including the repatriation of 22,000 exiled ANC members. 2 June, ANC Deputy President Mr. Nelson Mandela and State President F.W. de Klerk held discussions in Pretoria on the progress which has been made in the implementation of the Groote Schuur Minute and on the need to use effective mechanisms to reduce the level of police violence in the country. 4 June, Nelson Mandela leaves South Africa for a thirteen-nation international tour. 5 June, The Chairman of the Venda Council for National Unity, Colonel Gabriel Ramushwana, announced the lifting of the state of emergency and the unconditional release of all political prisoners in Venda. 6 June, Police detained three whites for questioning in connection with a hand grenade attack on 24 May against the Melrose House Museum near Pretoria. One of the three is said to be a member of the Afrikaner Resistance Movement. Police was still seeking right- wing extremist Piet "Skiet" (Shoot) Rudolph who claimed responsibility for the attack and who warned the media that this was the first step in a white backlash against President de Klerk's reforms. 7 June, In a statement to a joint session of Parliament, President F. W. de Klerk, announced that the four-year old state of emergency would be lifted at midnight on 8 June in three of South Africa's four provinces, with the exception of Natal and the homeland of Kwazulu. The security forces would be expanded in Natal, he said, "to maintain order and stability". He also announced the release of 48 political prisoners. 8 June, National State of Emergency is to be lifted with the exception of Natal. 8 June, Countrywide state of emergency lifted; partial emergency declared in Natal. Wide-ranging powers of arrest and detention remain in place. 19 June, South Africa:Signs trade agreement with the government of the Republic of Malawi. 19 June, Mr. Farah stressed, at a press conference in Pretoria, the need for a series of confidence-building measures that could reduce the political violence and increase the level of trust and understanding among all parties and between the people and the Government. 19 June, Upon the departure of the United Nations team from South Africa, Under-Secretary-General, Abdulrahim Farah, at a press conference in Pretoria, said that the important policy initiatives announced by President de Klerk were warmly welcomed by all the organisations that met with the team. Stating the concern of many in South Africa over the alarming degree of violence in parts of the country, he expressed the need for a series of confidence building measures that could reduce the political violence and increase the level of trust and understanding among all parties and between the people and the Government. He reiterated the United Nations support for an end to the apartheid system through negotiations. Prohibited any demonstration or gathering of people without the written consent of the magistrate of that district. 22 June, Offices of the Minister of National (Black) Education, Stoffel van der Merwe, and that of Deputy Consitutional Development Minister, Rolf Meyer, are bombed by white far-right wing members. 22 June, Nelson Mandela addressed the Special Committee against Apartheid in New York, saying that nothing which had happened in South Africa called for a revision of the position that the Organisation had taken in its struggle against apartheid. He urged the United Nations to do everything in its power to maintain the consensus it had achieved when it adopted the Declaration on Apartheid in December 1989. 22 June, Nelson Mandela addressed the United Nations Special Committee against Apartheid in New York, saying that nothing which had happened in South Africa called for a revision of the position that the Organisation had taken in its struggle against apartheid. He urged the United Nations to do everything in its power to maintain the consensus it had achieved when it adopted the Declaration on Apartheid and its Destructive Consequences in Southern Africa in December 1989. 2 July, A week long labour stayaway, organized by the ANC and its allies, begins in protest against factional black violence in Natal. 2 July, According to a press statement released by the Congress of South African Trade Unions (COSATU) and the United Democratic Front (UDF), about three million workers stayed away from their job for one day following a call made by COSATU, UDF and the African National Congress (ANC) for a week of action to pressure the Government into ending the violence in Natal. 6 July, The right wing bomb campaign continues when a powerful bomb explodes in Johannesburg, injuring twenty-seven people. 6 July, The ANC condemned the "tolerant attitude the South African authorities have adopted to the violent activities of far-right and fascist groups" after a bomb exploded in a Johannesburg bus and taxi terminal, wounding more than 25 persons. An extreme-right group called "the White Wolves" claimed responsibility for five other bombings carried out during the previous days, including one against a liberal politician and another one against a synagogue. 8 July, Thousands of Alexandra townships residents attended the funeral of activist Meshack Kunene. He was killed by security police on 30 June during a welcome rally for the ANC Secretary-General, Mr. Alfred Nzo. 14 July, Chief Mangosuthu Gatsha Buthelezi, leader of the Zulu Inkatha Movement, announced the transformation of the Movement into a multiracial political party. 16 July, The ANC sent a report on police violence to President F. W. de Klerk and demanded an end to "the shocking inhumanity" of police action in rural areas. The report is based on about 50 statements to lawyers by victims of police action in the farming towns of Ashton, Montague and Roberston. ANC leader Walter Sisulu had already accused the Government of failing to restrain the police after young activist Meshack Kunene was shot to death on June 30 in the Alexandra township. 22 July, According to South African press reports, based on leaks from the security forces, up to 40 members and officials of the ANC's military wing, Umkhonto We Sizwe (Spear of the Nation), were recently captured while infiltrating South Africa from bases in exile. 24 July, The Special Committee against Apartheid issued a statement concerning the Report of the Secretary-General on the Progress made in the Implementation of the Declaration on Apartheid and Its Destructive Consequences in Southern Africa. It agreed with the Secretary-General's observation that although the process of change in South Africa had started, it was still at a preliminary stage. The Secretary-General introduced the report at a resumed session of the General Assembly held on 20 July. The General Assembly decided to hold a full discussion of the report from 12-14 September 1990. 24 July, The Special Committee against Apartheid issued a statement concerning the Report of the Secretary-General on the Progress made in the Implementation of the Declaration on Apartheid and Its Destructive Consequences in Southern Africa. It agreed with the Secretary-General's observation that although the process of change in South Africa has started, it is still at a preliminary stage. The Secretary-General introduced the report at a resumed session of the General Assembly held on 20 July. The General Assembly decided to hold a full discussion of the report from 12-14 September 1990. 25 July, Senior ANC member, Sathyandranath 'Mac' Maharaj and over forty other members of the ANC and the SACP, are detained for allegedly attempting to overthrow the government (Operation Vula). 29 July, The South African Communist Party (SACP) came out to public political life at its largest rally ever, which was held in the township of Soweto. It introduced its 22-person "interim leadership" to a crowd of 40,000 people. 31 July, One day before the Harms Commission was to resume its inquiry on the activities of the Civil Cooperation Bureau, the South African Defence Force were being transferred to regular units of the army. August, Trade agreement between Hungary and SA. 6 August, African government and the ANC, according to which the latter agreed to suspend the armed struggle. 7 August, The ANC and the South African Government issued a joint declaration (the "Pretoria Minute") at the conclusion of 15 hours of talks. The ANC announced that it would immediately suspend all armed actions, while the Government undertook to consider lifting the state of emergency in Natal "as early as possible" and to continue reviewing the security legislation and its application "in order to ensure free political activity". The final report of the Joint Working Group on political offences was accepted by both parties. Both sides pledged to redouble efforts to reduce the level of violence in the country. 10 August, Signs trade agreement with Hungary. 15 August, Troops were deployed in three densely populated townships southeast of Johannesburg after three days of fighting between members of the Inkatha Freedom Party and ANC supporters, during which 150 persons were killed. 16 August, President F. W. de Klerk and Nelson Mandela held emergency talks in Pretoria as violence spread to Soweto. Fighting started there when Zulu migrant workers armed with axes and spears attacked passengers at a train station. 17 August, The ANC as well as COSATU issued statements accusing elements of the South African security forces of orchestrating the conflict in the townships, saying that they had evidence of forged pamphlets being dropped in the migrant workers' hostels conveying the impression that the ANC wanted to attack Zulus and drive them out of the townships. 21 August, In a statement on South Africa, the twelve Member-States of the European Community expressed their "great concern" at the increasing violence, saying that they expected the South African authorities to "do their utmost to stop the violence in an impartial manner". 22 August, Official estimates put the death toll at 503 people killed during the ten previous days of violence. Fighting was particularly heavy in the township of Vosloorus, 20 miles east of Johannesburg. 23 August, Co-leader of the Democratic Party Zach de Beer said he believed that police, in particular young officers, may not have been impartial in the township conflict. 24 August, More than five hundred people die in eleven days of fighting between township residents and migrant Zulu workers in the PWV region, and the government declares a State of Emergency in this region. 27 August, At a four-day Conference on "Anatomy of Hate", organised in Oslo by the Elie Wiesel Foundation for Humanity and the Norwegian Nobel Committee, Nelson Mandela accused the South African Police of encouraging factional fighting around Johannesburg, and denounced the "inability of the Government to put an end to this carnage by restraining the police force." At a mass funeral held at Jabulani Stadium in Soweto and attended by some 6,000 people, Archbishop Desmond Tutu said that a delegation of churchmen would meet President de Klerk to convey to him that there was overwhelming evidence that the police had favoured Inkatha in the recent conflict. 31 August, The Special Committee against Apartheid issued a statement expressing deep concern at the deterioration of the situation in South Africa, the continued detention of Mac Maharaj and the arrest of leaders of COSATU. It indicated that "it considered it imperative that the South African authorities adopted effective measures to ensure the impartiality of the police in this situation". It also made "an urgent appeal to the parties concerned to seek a mechanism that will stop this senseless violence and will enhance the possibility of a future national reconciliation. 31 August, The Natal Congress of the National Party unanimously approved a call by the party leadership to "make membership of the National Party accessible to all South Africans". The decision is subject to approval by the Party Congress in the three other regions of the country. The Special Committee against Apartheid issued a statement expressing deep concern at the deterioration of the situation in South Africa, at the continuous detention of Mr. Maharaj and at the arrest of leaders of COSATU. It indicated that "it considered it imperative that the South African authorities adopted effective measures to ensure the impartiality of the police in this situation". It also made "an urgent appeal to the parties concerned to seek a mechanism that will stop this senseless violence and will enhance the possibility of a future national reconciliation. September, The Goldstone Commission of Inquiry is established to investigate the Sebokeng massacre of 26 March, in which at least eleven people were killed during a protest march by township residents. The government launches Operation Iron Fist to curb township violence. 1 September, The report of the inquiry led by Justice Richard Goldstone into the shooting by the police of 18 demonstrators in the township of Sebokeng on 26 March 1990 was made public. The report criticised the actions of the police, saying that they had used force, which was "quite immoderate and disproportionate to any lawful object sought to be attained". Provided for civil judgements given in designated countries (mainly South Africa and the other homelands) to be enforceable in Transkeian magistrates' courts. 4 September, Signs a memorandum of understanding on road transportation in the Common Customs Area. 6 September, Two gunmen opened fire on a crowd of commuters in a Johannesburg railway station, killing five persons. 9 September, Signs co-operation agreement with Cote d'Ivoire regarding the technical management of the Abokouamekro Game Park. 11 September, A delegation of officials of the African National Congress (ANC), the United Democratic Front (UDF) and the Congress of South African Trade Unions (COSATU) met with President de Klerk to discuss the issue of violence. After the meeting, ANC Deputy- President Nelson Mandela, who led the delegation, warned that "the failure of action on the part of the Government threatened the peace process". 12 September, The Amsterdam-based Shipping Research Bureau published a report entitled "Fuel for Apartheid" on oil supplies to South Africa, which estimated that South Africa's efforts to circumvent the oil embargo have cost the country more than $US 2,000 million per year for over a decade. 13 September, At least six persons were killed and 400 shacks destroyed during a night attack on a squatter camp in the township of Thokoza. 14 September, Nelson Mandela said after meeting President de Klerk that the Government was convinced that there was "some hidden hand" behind the violence in the townships. 20 September, The ANC and the Inkatha Freedom Party announced that they had held high-level talks in Durban to discuss ways of ending violence in Natal and in the townships on the Reef. A joint statement issued at the end of the meeting called it a "historic" meeting, although the "matters discussed were in the main exploratory in nature". 24 September, Winnie Mandela is formally charged with four counts of kidnapping and of assault, and will stand trial with seven others in the events surrounding the murder of Stompie Moeketsi in December 1988. October, Trade agreement between Romania and SA. 8 October, Signs agreement with the government of the Democratic Republic of Madagascar regarding merchant shipping and related maritime matters. 8 October, A joint statement was issued following a meeting by President de Klerk and Nelson Mandela to discuss the recent violence. The statement acknowledges that there were "different current perceptions concerning the causes and handling of this violence". In a separate statement, President de Klerk announced that 20,000 exiles would be allowed to return to South Africa. 15 October, The Reservation of Separate Amenities Act is repealed.